Work done on time and on budget. Lol I was wondering if this review would come in. I hope you enjoyed your August, September and October in the pool! November? Maybe a little of a stretch. Glad we could help, and thank you for the positive comments. Metropolitan did a great job installing a new furnace at my house, 2 guys came and installed my furnace within 4 hours. They were very professional and clean which really meant a lot to me as a customer. This was a great job for us! Close to the shop and lots of space to move around the furnace. I will inform the crew about your positive review. Thanks for your continued loyalty. 25years and counting!!! Had a cracked heat exchanger, many other companies were trying to sell me a new unit, which shouldn't have been the case. Metropolitan came diagnosed the problem and explained to me what happened, and what was needed moving forward. Excellent service, both ways, customer service and technical. Thanks a lot! Thanks Austin, glad we could help in this situation. Heat exchangers are a tough job, that's why the other companies either refuse to do them, or try to sell you a new unit. Your furnace still had warranty. I'm glad you called Metropolitan. Had an emergency issue sunday evening with my water tank, made a call to Metropoltan heating/air-conditioning. They showed up monday morning and were able to replace it for me very quickly and efficiently. Very friendly guys. Thank you for your fast help. Mike and the guys came over at exactly 9am to replace my 30 year old ac. The job was very clean and more importantly I had a new Carrier ac and was able to sleep that night. Thank you guys! I will definitely get metropolitan back to replace my furnace when it comes time. Great job at a great price. Thank you Jen our team strives to deliver quality every time I have passed your comments on to Mike and Hayden they say you have the cutest dogs. Thank you Brian for the positive review. It was a bit of a tough job, but the work went quick because your plans were precise. We would be happy to work with you again on any of your HVAC needs. Excellent service fix all existing issues to existing services and very professional. Would recommend to my neighbours. Our new furnace was installed by two young guys over the winter. Towards the end of the installation an older man came and inspected their work and gave it the all clear. Less than two days later the furnace had stopped functioning and it sounded as if there was running water inside of it. I called the emergency service number and a technician was dispatched to look at it about a day later. This technician said that the pump had been installed in the wrong location and moved it to the other side of the furnace. He also said that it was unusual for this kind of error to be made. He left and the furnace ran for just short of two days when it stopped working again with the same sound coming from inside of it. I called the emergency service number again and a different technician was dispatched about a day later. This technician said that the plastic piping to the outside exhaust had been installed at a bad angle, causing condensation to build up in the pipe and run back into the furnace. He adjusted the pipes and the furnace has run properly ever since. We were without heat for almost a week and were very disappointed in the service provided to us by Metropolitan Heating and Air Conditioning. I reached out to the company through their email contact form on their website and requested a partial refund but never heard anything back. We are sorry for your negetive experience. We try to provide the top service to all our customers. We are also sorry that we missed your email. I will have our staff search for it again. Maybe it got dropped into an improper folder along the way. I wish you had called the office if you were unhappy right away so we could have taken care of it sooner. Here we are six months later and I feel bad that the email was missed, but I would like to talk with you. A 1 star review is not a good thing, and we take your complaint seriously. Please call the office so that we may speak. The technician came out within 2 hrs of my call, but sadly our furnace was dead. He laid out our options, and the next day we had a new high efficiency furnace and our own hot water tank. All in all a great experience and would recommend Steve and his guys to anyone. Thanks Seamus for the positive review. It was a bit of a tough install, but we powered through and got it done. My furnace stopped working on a weekend in January and although I hoped it would last another year, had been advised in June that this may be the last season.On call was great helping me to get it running and a tech came first thing Monday to assess further. It was advised and I agreed to replace it. Doug came out and we reviewed options. I decided to replace my approximately 30 yr. old a/c at the same time. All the work was completed a few days later, they were on time,professional and I really have to give them credit as the area they were working in is very small and cramped. They managed without having to remove walls, doors etc. When it rains it pours and I ended up replacing my hot water heater in March as well in the very small cramped space. They did it and everything works fine. The only advice I would give for future improvement to client satisfaction is to initiate a courtesy call when a crew is significantly delayed, which happened in March. However, when I contacted Doug, I did get an immediate call back. Thank you Linda for the positive review. Metropolitan always strives for complete customer satisfaction. I'm not sure why the breakdown in communication happened, but it was noted at the time , and we continue to work hard so that we can eliminate those kind of glitches in our service. Again, thanks for the 10 out of 10. We appreciate it! 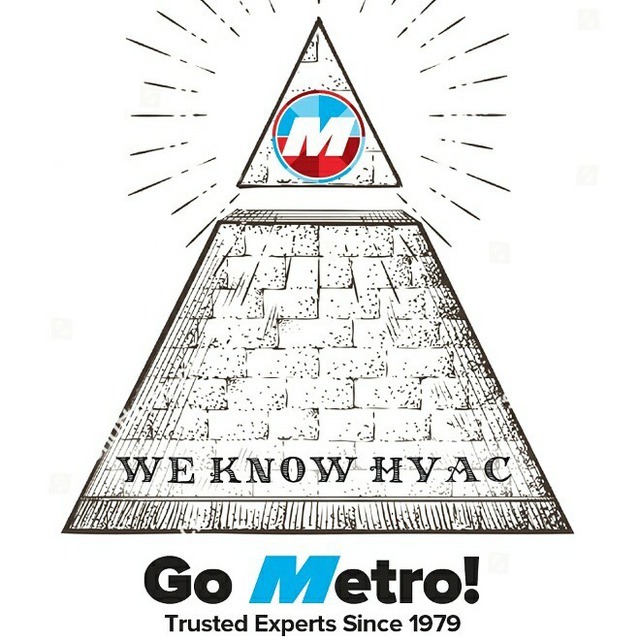 Metropolitan is a well-established heating and air conditioning company that specializes in residential and commercial heating, cooling and ventilation. We are proud to say that since 1979, we have been providing home comfort solutions to our customers. Metropolitan’s core management team has over 100 years’ combined experience in the industry, bringing a level of experience and attention to detail that translates into a smooth sales and installation process. Customers can feel confident that the job will be completed on-time and on-budget. Metropolitan is an authorized dealer of Carrier equipment. Our professional and courteous staff can assist you in keeping your home a comfortable place for years to come. At Metropolitan, we provide our customers with a service team that is second to none. Our professional and courteous staff is the right choice whether you require preventative maintenance, emergency service, or an annual cleaning & inspection. Proper maintenance of your heating and cooling appliances is essential for unit efficiency, indoor air quality and extended product life. At Metropolitan, our service plans are tailored to suit your needs, at competitive prices.